On Friday night, the Western Sydney Wanderers found joy between Melbourne City’s lines of defence and midfield when bringing their wide players inside, in what was a subtle tweak to their previous attacking approach. 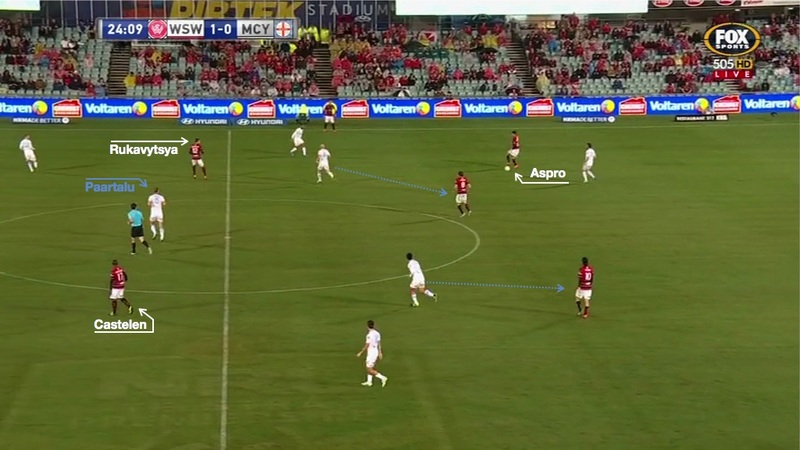 In the past, with wide players like Yousouff Hersi and Mark Bridge, Popovic has encouraged his side to play quite directly, using a strong target man like Dino Kresinger to win long balls from the back and as a target man for quick counter-attacks. Over the past two years, however, there has been a noticeable increase in the Wanderers’ desire to keep the ball, and a greater focus on playing out from the back. This, in turn, has changed the role of the wide players, who are now instructed to drift inside when the Wanderers have possession in the back third, becoming forward passing options and creating overloads between the lines. This means when a central midfielder or centre-back is on the ball, they have a straight passing option ahead of them to play forward into, with the likes of Romeo Castelen and Nikita Rukavytsya capable of turning on the ball and taking defenders on – the former, for example, has attempted the most take-ons in the league this season. 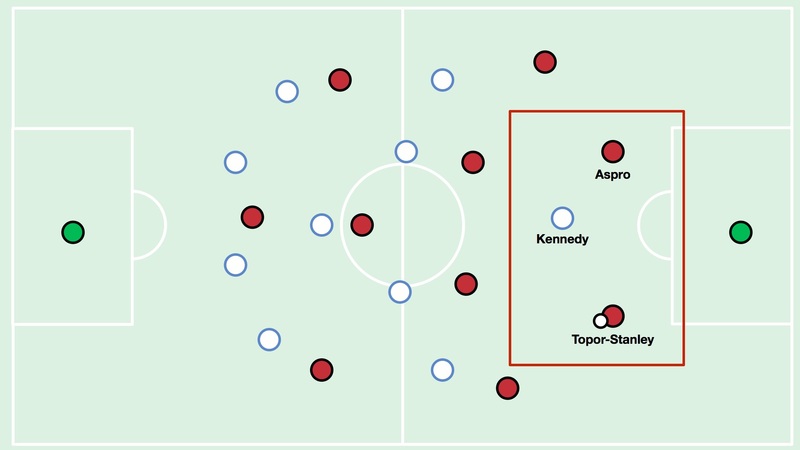 Against Melbourne City, the Wanderers were able to create overloads in two crucial areas of the pitch when they looked to build up from the back. Firstly, with their usual 4-2-3-1 formation against Melbourne City’s 4-3-3, it meant in possession the two Wanderers centre-backs outnumbered City’s lone striker, especially as City sat quite deep. Josh Kennedy rarely pressed and one of the two centre-backs was able to move forward on the ball and play a forward pass into midfield. Then, when the centre-backs passed into either Mateo Poljak or Yujiro Takahagi, their direct opponents in the City midfield, Aaron Mooy and Jonatan Germano respectively, pushed up to close them down. To escape this pressure, Takahagi varied his position intelligently, sometimes coming short close to the centre-backs (where his direct City opponent would be uncomfortable following him all the way). When a Wanderers midfielder received the ball facing forward, that was a cue for the two wide players, Castelen and Rukavytsya, to drift inside into the pockets of space either side of Erik Paartalu. This, in turn, allowed Mark Bridge, the #10, to push higher up, essentially becoming a second striker alongside Tomi Juric. As the two #8s in City midfield triangle wanted to move forward and close down their direct opponents, it meant the holding midfielder, Erik Paartalu was often overloaded by the two Wanderers wingers moving into the pockets of space either side of him. Here, Topor-Stanley has carried the ball forward into midfield, with two passing options ahead of him – Castelen and Rukavystya. Paartalu’s indecision is obvious as he has to deal with two free players on either side of him. Again, a Wanderers centre-back – this time, Jonathon Aspropotamitis (Aspro) – is in possession, with the two City #8s looking to close down on their direct opposition midfielders. This opens up the passing lane from Aspro to Rukavytsya, who has moved inside into the pocket of space next to Paartalu. Again, the Wanderers have created a 2v1 overload in that midfield zone. A further two examples from the match are analysed in the video below. There were two major outcomes because of this numerical superiority in the midfield zone. Firstly, when a Wanderers midfielder (often Takahagi, a wonderfully incisive passer who has brought some much needed creativity into that deep midfield position) was able to play forward into the feet of Castelen or Rukavytsya, the winger was able to turn and dribble directly at the opposition defence. Castelen, in particular, drove forward into space on a number of occasions, with Paartalu torn between him and Rukavytsya. The second outcome was that the City full-backs were often drawn upfield. While Jack Clisby was guilty of this (and was booked for a strong challenge from behind), this was more noticeable down the right hand side, where right-back Paolo Retre was drawn towards the winger, leaving a space between him and right-sided centre-back Tomi Juric that both Rukavytsya and Tomi Juric enjoyed sprinting into. Throughout the first half, City had major problems in that right-back zone – it was where Rukavytsya won the free-kick for the opening goal, while he also missed a 1v1 when sprinting in behind. Another example was when Juric latched onto a Takahagi pass, but sliced an ambitious shot wide. Later, when Rukavytsya had to go off injured, Mark Bridge moved to the left, and substitute Labinot Haliti played through the middle. The same patterns of play remained, however, with Bridge looking to drift inside (as can be observed in the second example in the video). As a result, John Van’t Schip felt compelled to swap Jonatan Germano and Retre ten minutes before half-time, with Retre moving to the right-wing, and Robert Koren moving inside as a #8. Germano didn’t defend as proactively, and focused more on narrowing the gap between him and Jailiens. Nevertheless, the Wanderers tactic of bringing their wide players inside to create overloads around Erik Paartalu helped create a number of opportunities in this match. In a broader context, it was indicative of a natural evolution that has occurred in their attacking play, with the switch from a more basic, direct style to a more possession-based construction from the back becoming increasingly obvious. It is a pity, more than anything, that their success has ultimately made it incredibly difficult for them to be competitive in the A-League this season. Tactical tweaks can only take you so far if the players are physically unable to be at the intensity and fitness required, though the success of a more controlled approach to build-up play against Melbourne City will be encouraging for coach Tony Popovic.